Shares in Nike jumped at the start of trade after it said it would start selling some goods though Amazon. The sportswear maker confirmed on Thursday that it would begin a "small pilot" selling goods directly through the online retail giant. Nike's shares soared 8% as the company also reported better-than-expected fourth-quarter results. Profits rose 19% in the quarter to $1bn, while revenues were up 13% to $4.2bn. Nike was the biggest riser on the Dow Jones, which was up 102.68 points, or 0.5%, at 21,389.71. 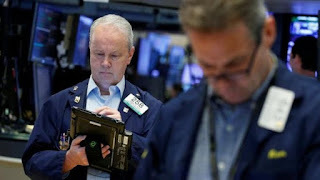 The tech-focused Nasdaq index rose 16.87 points to 6,161.22 while the S&P 500 climbed 9.86 points to 2,429.56. The Federal Reserve's preferred measure of inflation - the core personal consumption expenditures (PCE) price index, which excludes food and energy prices - rose at an annual rate of 1.4% in May. That was down from April's rate of 1.5% and below the Fed's target of around 2%. Other economic data released on Friday showed that consumer spending, a key driver of the US economy, edged up 0.1% last month, according to the Commerce Department.